‘Health is wealth’ is an old adage, but not many people tend to follow it. Considering the busy lifestyle and hectic schedules, people often ignore their health, especially mental health. Due to the stigma associated with mental health issues, men very conveniently try to keep these problems within wraps, instead of seeking help. Even if not associated with sins of past lives, black magic or result of poor deeds, they are frequently linked with weak moral, lack of willpower and disturbed lifestyle. Hence, such preconceived notions scare men and prevent them from seeking medical help for their mental health problems. As a result, their conditions worsen, leading to other problems like addiction and suicidal ideations. According to the Centers for Disease Control and Prevention (CDC), nearly 45,000 people committed suicide in 2016 of which 31,500 were men, implying that seven out of 10 people who commit suicide were men. Recently, the death of celebrity chef Anthony Bourdain by apparaent suicide in France, also echoed the widespread depression among men. Bourdain confessed to suffering from depression in an interview in 2016, however, he did not mention recovering from the condition. Hence, in order to create awareness about the increasing incidence of depression and other mental disorders among men, Men’s Health Week is observed every year. In 2018, it is observed from June 11-17 to encourage and motivate men of all ages to evaluate both their mental and physical health and to focus on living a healthy lifestyle. Even the White House recently released a message to mark the week, where President Donald Trump encouraged men to analyze both their mental and physical health. It said that mental health issues have been affecting the potential of many fathers and brothers and to lea happy life, it was important to seek help at the right time. Ideally, women are presumed to be more prone to depression due to factors like pregnancy, postpartum period, perimenopause, menstrual cycle, domestic violence, sexual assault, and molestation. However, the mental disorder is equally common among men as well. In fact, as per a study, young men are more likely to suffer from mental illnesses compared to women of the same age group. According to a study conducted by an international consortium, young men are more vulnerable to first-episode psychosis symptoms like hallucinations, delusions, and cognitive disorganization, which can further trigger the development of serious mental health disorders like schizophrenia, bipolar disorder, and depression. The risk is higher for those belonging to ethnic minorities or living in socioeconomically disadvantaged areas. Meanwhile, in adult men, it is often the loneliness that pushes them toward depression, though the cause of the condition can vary – genetic predisposition, environmental factors, personal tragedy, side effects of medication to substance abuse disorder. 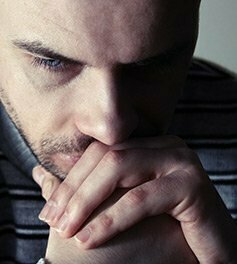 In the United States, more than 6 million men suffer from depression each year, stated the National Institute of Mental Health (NIMH). Whether in men or women, depression is a serious mental health disorder that can affect the quality of life to a great extent. Additionally, it can also lead to suicidal thoughts and tendencies and addiction. Therefore, it is important to treat the condition with the onset of the symptoms. However, differentiating clinical depression from general sadness can be challenging. Hence, it is essential to seek professional assistance to determine its presence accurately. Medical help can be sought through the mental health live chat available on the internet that gives information about the nearest treatment center. If you are looking for a depression treatment center, contact 24/7 Mental Health Helpline for a mental health chat. Call at our 247 helplines or chat online at our mental help chat. This entry was posted in Mental Health on June 14, 2018 by Admin.